Since the warehouse has been replaced, the scene cannot be reproduced. [Citing Dodson v. Persell, 390 So.2d 704 (Fla. 1980).] We find that Wackenhut has demonstrated exceptional circumstances regarding the photographs and authorize their discovery. In Florida Power Corp. v. Dunn, 850 So.2d 655 (Fla. 2d DCA 2003), Florida Power sought discovery of photographs taken at the scene of an accident. When its motion was denied by the trial court, Florida Power filed a petition for writ of certiorari with the district court. Although the district court agreed that the photographs were protected work product, it held that Florida Power was entitled to production of these photographs because it met its burden under Florida Rule of Civil Procedure 1.280(b)(3) [the predecessor to 1.280(b)(4)] by demonstrating exceptional circumstances and its inability to obtain the materials by other means. Because Kmart has satisfied the requirements of rule 1.280(b)(3) by demonstrating that the photographs in the plaintiff’s possession are relevant and material (they allegedly depict the condition of the floor at the time the plaintiff slipped and fell); there is no other means of obtaining the discovery requested (no other photographs were taken of the scene ten years ago when the incident allegedly occurred); and the photographs are the best evidence of the condition of the floor at the time of the alleged slip and fall, the trial court departed from the essential requirements of the law in denying Kmart’s request for production. Because there is no substitute for the information Kmart seeks and no way on plenary appellate review of evaluating how the information may have affected the case, Kmart has demonstrated irreparable harm and the petition should be granted. See Criswell, 636 So.2d at 563; Ruiz v. Steiner, 599 So.2d 196 (Fla. 3d DCA 1992); Carroll, 528 So.2d at 954; Colonial Penn, 380 So.2d at 1306. In our experience, most parties turn over such photographs without lodging the work product objection. Reasonable lawyers know the law and understand the importance of certain photographs to the case. Unfortunately, some lawyers prefer to engage in obstructionist tactics in the slim hope of denying justice. More likely, it’s an opportunity to bill the client. We are currently involved in a catastrophic injury case against such a lawyer. He has refused to turn over the only post-accident damage photographs of his client’s vehicle, which were taken at the scene by his client using a cell phone. (Our client was run off the road and struck a tree. 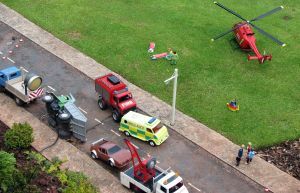 She was airlifted to the hospital, and thus was in no condition to take photographs at the scene.) We are awaiting a court date to compel production of the photographs. (This lawyer has also refused to provide cell phone information to determine if his client was using his phone at the time of the crash. We are seeking this material as well.) A third driver readily produced, through her lawyer, photographs of her vehicle taken at the repair shop. Sadly, not all lawyers are decent people. IMPORTANT NOTE: Judges will require more than unverified claims that the seeking party is unable to obtain the substantial equivalent of the work product material without undue hardship. At the very least the attorney for the moving party should file a verified motion in which the claim is asserted. In addition, at the hearing on the motion the lawyer should ask the judge to swear him or her in so as to add greater import to the allegations of need and hardship. Finally, affidavits of people in the know can be used to establish the moving party’s position. The work product privilege sits on highly fortified ground. One must be well-armed when seeking to breach its walls.